Appearance - Bobcats are typically about 3 feet long from nose to tail tip, about one and a half to two times the size of a common domesticated cat. They stand approximately 14 inches tall at the shoulder, and range in weight from 15 to 30 pounds. Bobcat coats can be a range of brown colors, from grayish to reddish with dark spots. Behavior - You may be living near a bobcat and not even know it. Bobcats will not enter human habitations and are by nature nocturnal loners; they are rarely seen in Local, making bobcat removal difficult. With this being said, you may find that your only sign of a bobcat problem is harmed or dead animals on your property and physical signs like track marks. Bobcat prints do not show claw marks. Bobcats are predators that eat mammals, birds, and reptiles. They will readily eat rats, mice, and rabbits. Bobcats have been known to prey on domesticated pets. If you have a chicken coop, or house cats or small dogs that are often outside at night, your home could be a target. Bobcats do not hunt in packs and tend to only be out at night, so leaving your pets outside is risky and could be attracting a bobcat without you realizing it. Additionally, if you have visitors like white-tailed deer, rabbits or feral cats who are frequent visitors to your property, you are at risk of having a problem with bobcats seeking food. Bobcats are known to be opportunistic predators, meaning that once they have found of way of quickly obtaining prey, they will settle into that area and become repeat visitors. Bobcats will normally never attack humans due to their fear and the size difference, but will potentially attack your house pet. Keep small dogs and house cats indoors at night because this could lead to harm or death of your beloved pet and can be attracting the bobcat to your property. Once bobcats have made a home, they are known for making their way back there, thus making bobcat removal and relocation in difficult. If you have any suspicion that there may be a bobcat on or near your property, it is best to call a professional to assess the situation and look for signs of a bobcat presence. 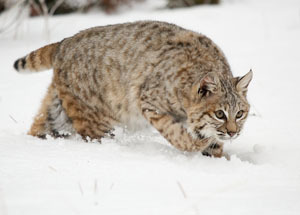 Bobcat removal should only be handled by a local wildlife removal professional.